Guest Post by jenna romano. Jenna, originally from New York, completed her degree in Museum Studies at Arizona State University. After working in Paris for a summer, she traveled around Europe and the Middle East until landing in Israel, where she began studying fine art at the Jerusalem Studio School and working in the tour industry. She currently resides in Jerusalem, where she enjoys being surrounded by the vibrant people & culture, and discovering the blossoming contemporary art scene. With its 50th anniversary approaching, the Israel Museum will be hosting a number of formative events and exhibitions this year. 6 Artists, 6 Projects is the first of them. After many months of studio visits around the country, curators of Israeli art and photography have carefully chosen six distinguished Israeli artists. 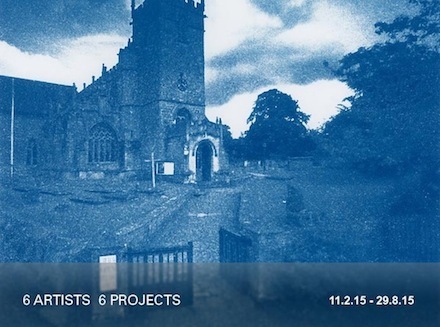 They are launching their array of solo shows for the first time in this exhibition. The exhibition, which opened on February 11th, will close on August 29th. Like the Israel Museum itself, which hosts a wide range of work from biblical archives to a newly renovated contemporary art wing, the artists here are distinct. They are inspired by different subjects and methods, and work in different places around the world. This diversity is evidence of the expansion of Israeli Contemporary art. As a new immigrant to Israel, and an art addict, I am especially excited to share with you a glimpse of each artist: their background, their technique and a short review of the projects at hand. Each month over the span of the exhibition we will focus on a different artist or aspect of the show. Stay tuned and enjoy! It is my pleasure to introduce a new review, featuring artist Ido Michaeli (read my previous review here). Ido Michaeli was born in Petach Tivkah, Israel and now works and lives in New York City. He received his MFA from Betzalel Academy in Jerusalem where he won an award of excellence. The artist tends to explore subjects in sociology and is largely influenced by topics in his home country of Israel and the surrounding Middle East. Michaeli’s careful execution of his works are a result of deep examination of his subjects and meticulous knowledge of the various processes and mediums he likes to experiment with. He is not afraid to break out of his studio to make a new project happen. A fascination with aesthetics and symbols leads his career in a very unique direction! Viewing Bank HaPoalim Carpet is a particularly unique experience. A carpet is a striking medium for a contemporary art installation. At first sight it gives the audience mixed impressions. However, Michaeli’s unconventional method along with the aesthetic qualities of the carpet highlight the layers of this complicated project. 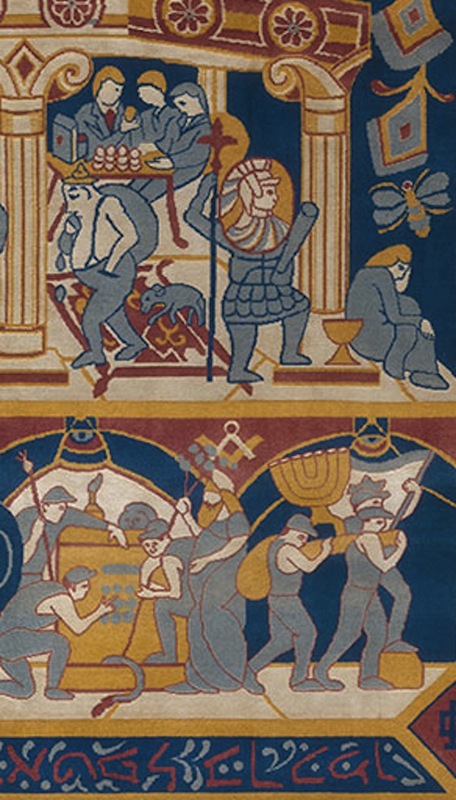 Bank HaPoalim Carpet, hand-woven of wool and silk, hangs majestically in Michaeli’s exhibition. 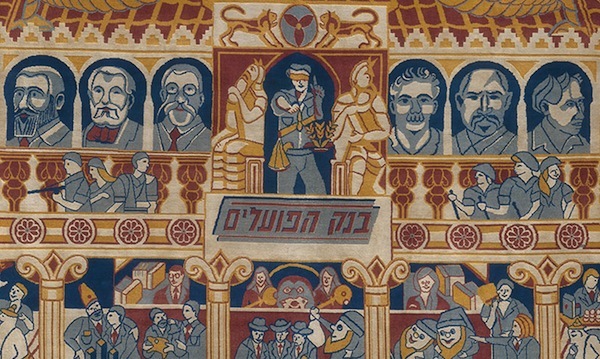 The central focus of the carpet is a rendition of Israel’s Bank HaPoalim (“workers bank”). This structure reveals playful scenes that are endlessly captivating. With only five solid colors and a well-planned grid, Michaeli takes advantage of the of the Afghani carpet’s venerable layout. One result is that the myriad images which Michaeli plays with are clearly defined. About 100 symbols taken from the bank’s history, socialist art, religious architecture, art history and more invite the audience to interpret the carpet’s elements. Michaeli began designing in 2010. With the help of carpet dealer Yitzchak Mattat, the design was made in Kabul, Afghanistan. 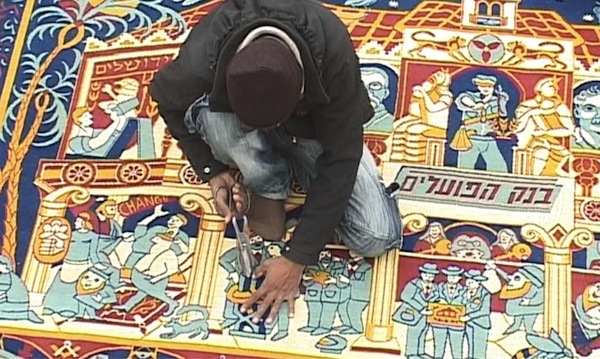 Over the course of a year, The Bank HaPoalim Carpet was crafted. “The process was done in stages and at times nerve-racking. They would send me a photograph of a completed segment of the carpet, then receive payment and begin work on the next stage, and so on. Michaeli accredits the Afghan workers as partners of his artistic vision. They weaved his Israeli symbols and words to life. It’s easy to internalize the poignancy of this experience. A new relationship between these two countries who have no diplomatic relations was created. Navigated across closed borders, the carpet was smuggled via Pakistan and Turkey to make its way into The Israeli Museum’s gallery. From ancient times onwards, oriental carpets have been associated with wealth and power. Michaeli is able to attribute these qualities to his Bank HaPoalim. Fabricated here as a three-story building, the bank’s levels become allegories for social stratification and a central topic for this piece. At the top, portraits of political leaders stand for the establishment of Zionistic nationalism in Israel. In the middle are representations of bankers, an emphasis on currency and accumulated wealth. Pictured at the lowest level are a class of laborers. Surrounding these are figures of robbers breaking into safes and running off with loot. Their presence symbolizes a disregard for any order or power. This sensual phrase anthropomorphizes a safety vault into a beautiful bride. It romanticizes the robberies taking place inside the image. Emphasizing disorder within the Bank HaPoalim tribute, this leads to a conflicting message. It is just one of the many fabrications the viewer will encounter. Accompanying the carpet are a computer application, which reveals the origins of each symbol, and a short film documenting the making of the carpet. The additions create an interactive setting and allow us to decipher some of its elements. Bank HaPoalim Carpet is an interface of mysterious connections, creating impossible conclusion. Despite historical references, Michaeli’s carpet moves forward to new encounters. Mimicking conflicts in Middle Eastern culture and world history, unlocking vaults of untold stories, it is engaging from start to finish.